I make these biscuits for Thanksgiving as a treat for my mom. She loves her biscuits warm and slathered with butter. Actually....I love my biscuits warm and slathered with butter. Like mother like daughter I guess. :). The key to tall, flaky and tender biscuits is mixing and handling the dough as little as possible. Over handling makes them tough and dense....and makes my mom unhappy. Enjoy! 1. Preheat oven to 450F. Line a baking sheet with parchment paper. 2. Combine and sift the flour, baking powder, baking soda and salt. Place the flour mixture in a food processor. Pulse the flour mixture a couple of times to make sure it's well combined. 3. Add the butter cubes to the flour mixture and pulse to cut the butter into the flour. It should resemble course meal. 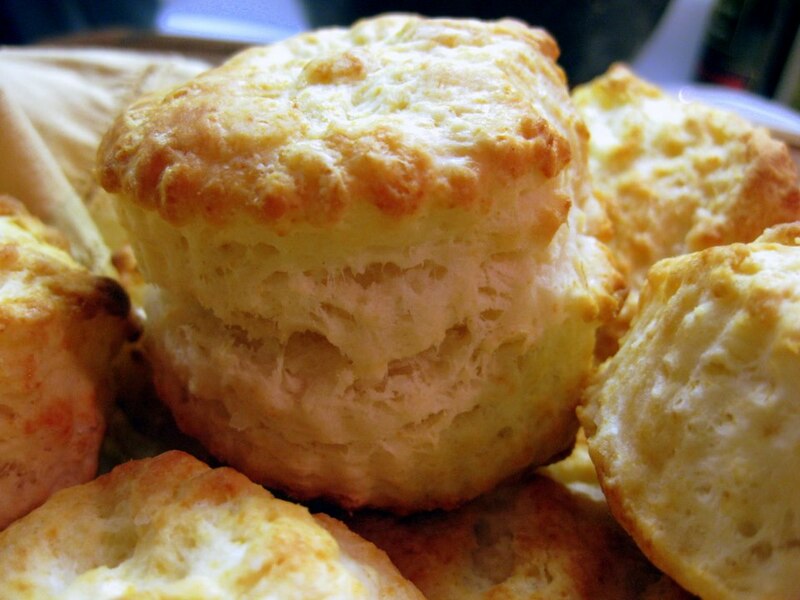 Don't over mix or the biscuits will not be tender and flaky. 4. Add the buttermilk to the flour/butter mixture and pulse until the dough just comes together into a ball. Again, don't over mix. 5. Remove the dough from the food processor and place it onto a well floured surface. Using your hands, pat the dough down until it's about 1/2 inch thick. Fold the dough 4- 5 times then pat the dough down until it's 1 inch thick. Use a round (2 - 2 1/2 inch) cutter to cut the dough into rounds. Place the biscuits on the baking sheet. Combine the dough scraps, pat the dough down to 1 inch thick and cut out a few more. 6. 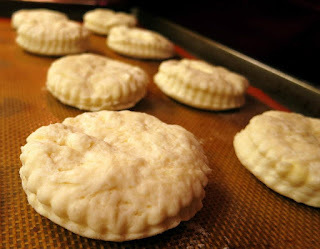 Brush the tops of each biscuit with a little buttermilk. Bake for about 10-12 minutes or until the biscuits are a light golden brown. I rotate the baking sheet 180 degrees half way through for more even baking. Folks, I recommend doubling the recipe because they vanish quickly into peoople's mouths. They look too good to pass up! Awesome n perfect !!! Frst time hr .. Lov most of ur recipes... Hapi to follow u.. Glad if u do d same!! !